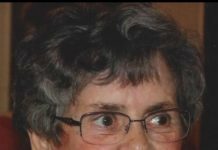 Marlborough – Anita (Steward) Auger, 81, died Sunday, Oct. 23, 2011 at Marlborough Hills HealthCare Center. Born in Northborough, she was the daughter of the late Walter and Abbie (Martin) Steward. She was also the former wife of the late Raymond Auger, who died in 2001. Mrs. Auger had been employed as an assembler at the former Frye and Diamond Shoe Companies prior to working for the Digital Corporation as an equipment tester in Marlborough and Franklin, retiring in 2001. She had been a member of the former St. Ann&apos;s Parish, Marlborough. She is survived by her son, Paul Auger and his wife Janet of Marlborough; her brother, Richard Horton and his wife Beverly of Seabrook, N.H.; her sister, Beverly Silva of Sutton; and her grandson, Chad Auger and his wife Kimberly of Clinton. She was also the sister of the late Barbara Murphy. A funeral Mass will be celebrated Wednesday, Oct. 26, at 10 a.m., at St. Matthias Church, 409 Hemenway St., Marlborough. Burial will follow at Howard Street Cemetery of Northborough. Visiting hours will be held Tuesday, Oct. 25, from 4 to 7 p.m., at the Slattery Funeral Home, Inc., 40 Pleasant St., Marlborough. Respecting her lifelong love of animals, memorial donations, in lieu of flowers, should be made to Sterling Animal Shelter, Inc., 17 Laurelwood Rd., Sterling, MA 01562.